Love is what makes the ride worthwile. There is something very special about creating gorgeous bouquets and arrangements for one of the most unforgettable moments in a couple's life. We take snapshots of our wedding florals before they are whisked away to the event; it isn't often we see the final picture. Ever wonder what happens to the flowers after they leave the shop? One of our delightful wedding couples sent us pictures from their big day to share with you. Meet Jaicie and Kyle Conner! Their wedding was on a sunny Saturday in September, 2015. 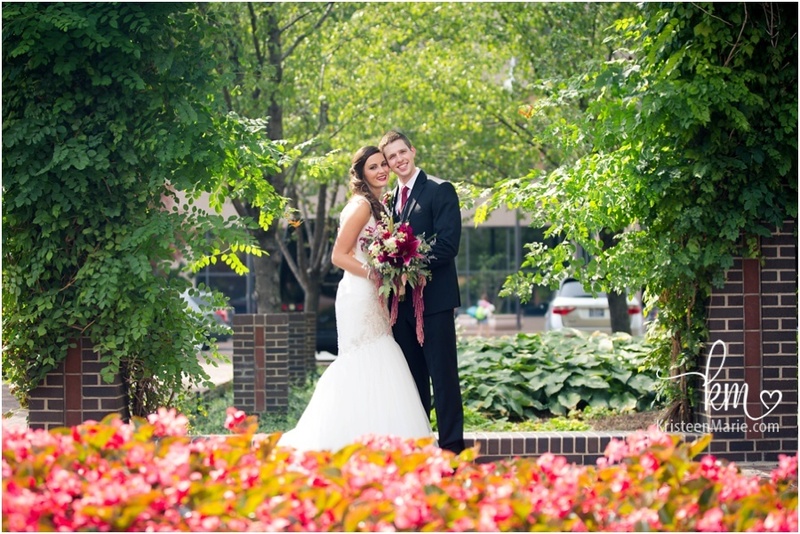 Surrounded by family and friends, they married at the Omni Severin downtown Indianapolis. The Conners' and Photographer, Kristeen Marie Photography, were kind enough to share photos of the end result. 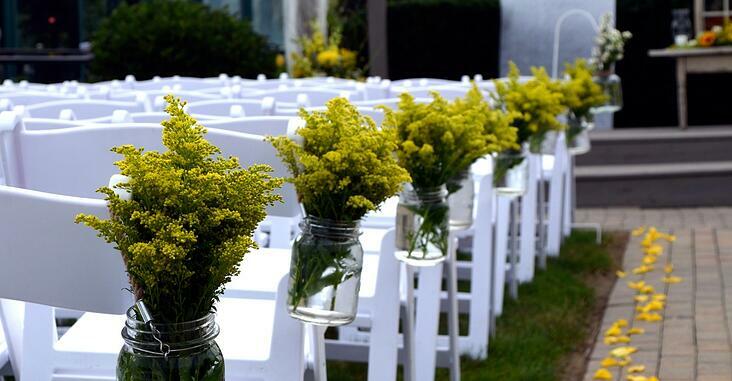 Not only do they contain wedding party bouquets designed by the talented staff of Gillespie Florists but also DIY (Design-It-Yourself) centerpieces by the bride! 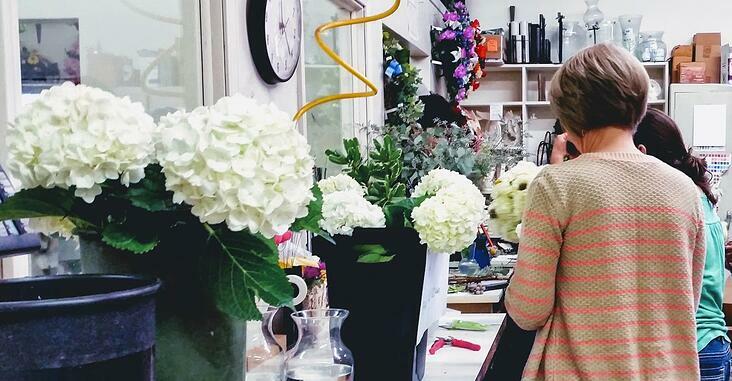 At Gillespie Florists we have DIY options where you purchase the flowers from us and can come on in and design them onsite! Learn more about DIY flowers here. 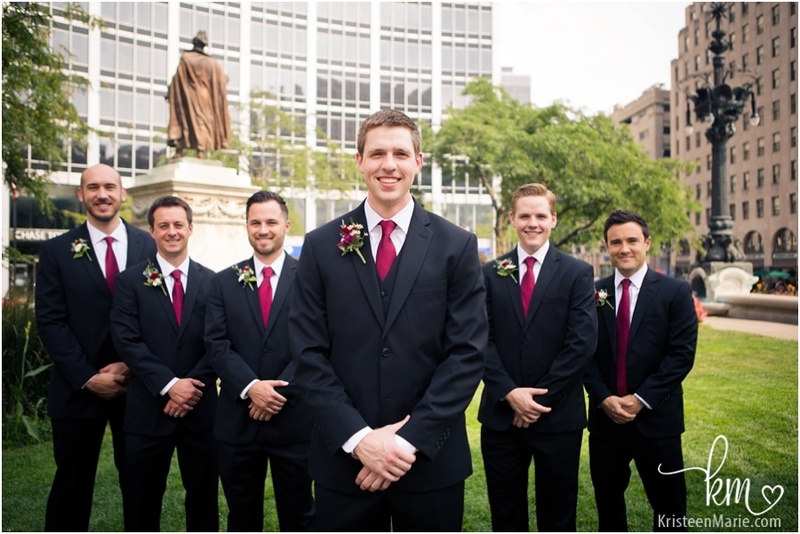 Without further ado, please enjoy these beautiful photos from Kristeen Marie Photography! Let's start off with the bridal party, shall we? Such lovely ladies and beautiful bouquets! 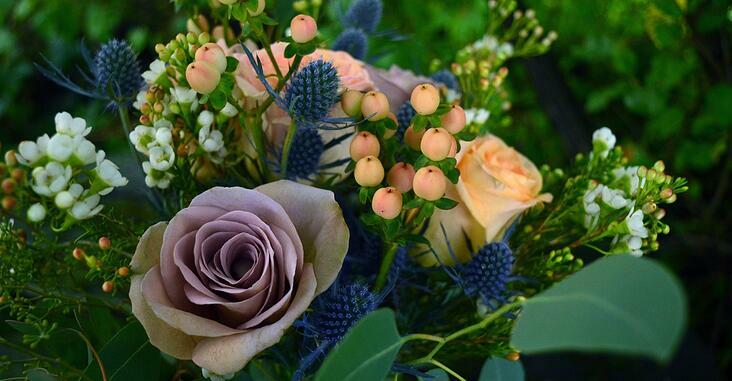 The color and theme took shape around the Bohemian style of the clutch bridal bouquet. Soft, flowing, with a fantastic variety of texture through the burgandy hanging amaranthus, seeded and gunni eucalyptus, misty limonium, and white open cut roses. Sumatra lilies and dark red spray roses added depth to the design while the cream ribbon wrap tied the look together. 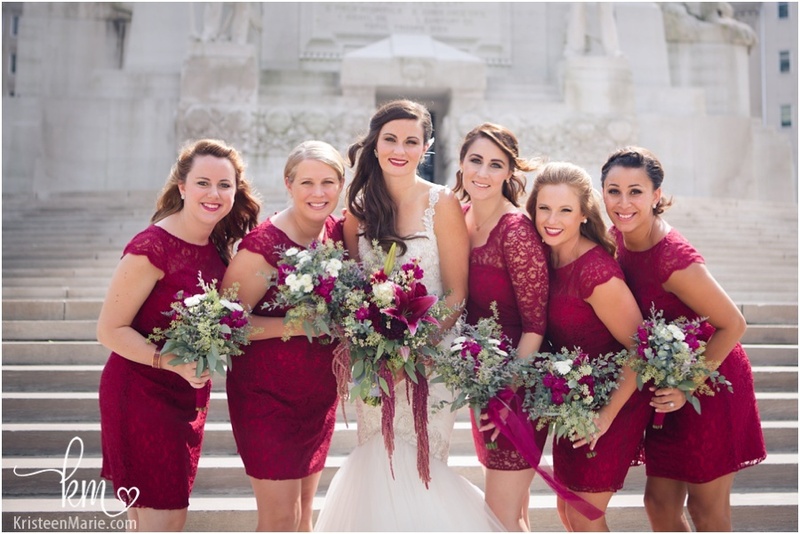 The bridesmaids shared a similar style of clutch bouquet with white button mums, misty limonium and gunni eucalyptus, hand-tied with a deep red ribbon wrap for added pop of burgandy color. Here comes a closeup of the bridal bouquet and the happy groom! Mr. Kyle Conner is styling with a deep red spray rose bloom, white button mum bloom and purple cushion mum bloom with touches of white waxflower, misty limonium and seeded eucalyptus in his trendy boutounniere. The groomsmen wore similar boutouniere sans a purple cushion mum bloom. Let's see a photo of all these handsome men together! Looking sharp! Speaking of members of the wedding party, we've got a couple of reception photos from the reception featuring the cake! The cake topper was centered around a beautiful silver letter "C" embedded with rhinestones! The designers artfully designed loose flowers including white button mums, red alstroemeria, amaranthus, eucalyptus and more around this special piece. The final effect is elegant with a flair of whimsical fun which is an excellent combination for a Bohemian theme. You may be wondering why I haven't mentioned the table centerpiece to the right (your right) of the image above. This arrangement shares a special quality with the centerpiece in the photo below. Do you know what it is? 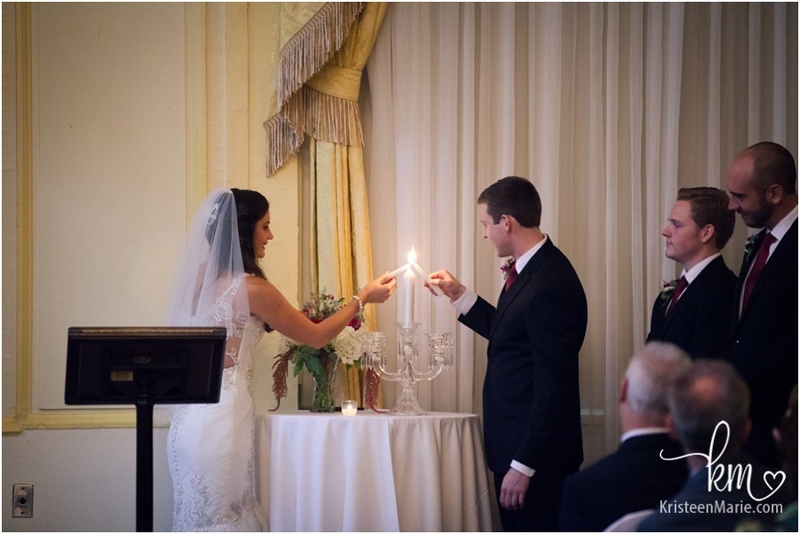 I'll tell you, but first, let's appreciate the precious moment happening, the lighting of the Unity candle. Okay, still waiting for me to divulge the interesting commonality between the two centerpieces. Actually between the altar centerpiece and the cocktail, guest table, and small centerpieces at the reception. Besides using limonium, red alstroemeria, seeded eucalyptus, red hanging amaranthus, and hydrangea, these centerpieces were all DIY (Design-It-Yourself)! How does DIY work at our shop? The client, like Jaicie, provides the containers and purchases the flowers at a discounted rate from Gillespie Florists. Then we provide the design space and help, when needed, as the flowers are assembled by client and friends! It is a great way to save a bit of money and spend time with friends/family while adding an extra special personal touch to your big day. Thank you once again Kyle and Jaicie Conner, for having us share in your wedding day! Congratulations! 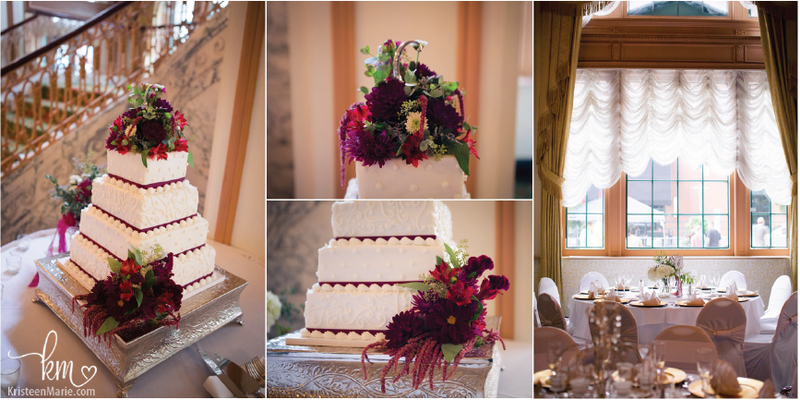 Special thanks to Kristeen Marie Photography for providing the superb photos of the wedding and reception! Finding inspiration in this article for your wedding day? Check out our online wedding collection here! Schedule a free wedding consultation with our wedding specialist!